Pledge Nature Reserve – The nature reserve is located in the heart of Knysna downtown. Without doubt for those who can, it is well worth following the meandering trails along the streams to the Reserve’s highest point. Knysna Timber Route – The Knysna Forest is world famous for its beauty, dark recesses and giant Outeniqua Yellowwoods, some of which are almost a thousand years old. It has achieved a mythical and permanent place in South African literature through the works of novelist Dalene Matthee. Robberg Nature Reserve – Robberg, situated 8km south of Plettenberg Bay, is not only a nature reserve, but also a national monument and World Heritage Site. Rocks from this region date back 120 million years. Excellent walking trails for the very fit and not so fit. Featherbed Nature Reserve – This reserve is an utterly unique privately owned reserve that lies on the Western Head of the famous landmarks known as ‘The Heads’. 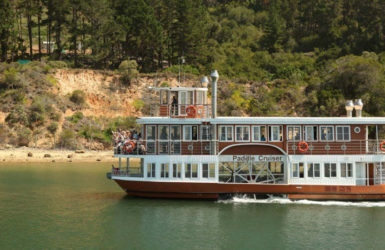 The reserve can only be reached by ferry – operated by the Featherbed Company. Goukamma Nature Reserve – Goukamma Nature Reserve and Marine Protected Area, situated between Sedgefield and Knysna, is a World Heritage Site. A great time to visit is in September/ October when the first spring rains create splashes of bright spring flowers amid the fynbos. Tsitsikama National Park – Home of the Big Tree is a protected area on the Garden Route, stretching from the Western to Eastern Cape. A visit ensures you have the best of indigenous forest on one hand and the pounding Indian Ocean on the other. Indigenous Millwood Forest – Enjoy hiking, biking and picnicking in this beautiful forest. A visit to the first Gold Mine in South Africa at Millwood and coffee at Mother Holly’s or lunch at Totties is a must. Steenbok Nature Reserve – Another reserve on your doorstep when staying in Knysna. The reserve covers an area of 17 hectares and forms part of the greater Knysna Protected Environment Area regulated by the South African Parks Board. Garden Route Trail – The route traverses two nature reserves, the Wilderness National Park and Goukamma Nature Reserve which are both wonderfully protected areas of the diverse indigenous flora in the region. Come share the passion of your guide for this ecological marvel where the mountains bow to the sea, where lakes are fringed by forests and where the surf caresses golden sands.